Here's a quick and easy tool that's handy when you're reviewing another website for your blog. ShrinktheWeb quickly generates thumbnails in six different sizes. The largest is 320 x 240 px and the smallest is 120 x 90. To generate your thumbnails, just type in the url. You may have to wait a few seconds if there's a queue. 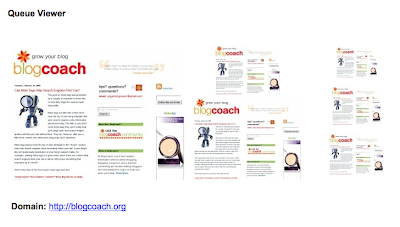 Here's what it generated for BlogCoach (the thumbnails are really a bit bigger. I had to adjust the image so that it would fit here): Right click with your mouse and select "Save Image As" to save one of the images to your desktop. All thumbnails are refreshed once a month. The only drawback I can see to ShrinktheWeb is that the captures aren't full length. To get a full-length capture you'll need to sign up for ShrinktheWeb's pay service.